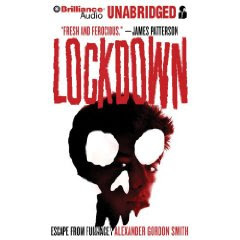 Lockdown (Escape From Furnace) by Alexander Gordon Smith. Farrar Straus & Giraux 2009. Brilliance Audio 2009. Narrated by Alex Kalajzic. Reviewed from audio from publisher. The Plot: Alex Sawyer admits he is a thief. Has been for two years, since he was twelve. Started with money from kids on the playground; moved up to burglary. But he is NOT a murderer. He did not kill his best friend, Toby. Nobody believes him, though. So Alex gets sent to the worst prison ever imagined: Furnace. Beneath heaven is hell. Beneath hell is Furnace. The Good: Have readers who are adrenaline junkies? Who want books were things actually happen? Who have little patience for books about thoughts, and feelings, and emotions? Who don't want books that are all about lessons? Give them Lockdown. And guess what? There are thoughts and feelings and emotions, but they are wrapped up in a nonstop breathless reading experience. And there is a lesson or two. Either, "don't do the crime if you can't do the time." Or, it's OK for guys to show emotion by crying, especially when they are tough, strong criminals wrongfully accused of murder who are thrown into prison and have to witness other inmates eaten by out of control dogs. All of Lockdown is set in Furnace; but a handful of flashbacks tells us how Alex got himself in this situation, a life sentence in Furnace. A prison just for teenagers -- well, some only boys, younger than teenagers -- who society decided are too scary, too dangerous, too bad to be free. Instead, they are sent to Furnace, with no promise of parole, no hope of escape. Death is the only way out. Alex doesn't understand why he was framed. He may be innocent of murder, but others in Furnace are not. His new cellmate, a few years older than Alex, was eleven when he killed a man. Gang members from the "Summer of Slaughter," when teen gangs killed mercilessly, control Furnace. Well, control Furnace to a certain extent. The person really in control? The warden. And his silver-eyed, black suited guards. The odd, wheezy men wearing gas masks. And the dogs... Don't forget the dogs. The blacksuits, the wheezers, the dogs.... aren't normal. Aren't like anything you'd see on the street. They are monsters. What is worse? Being taken away at night, disappearing.... or being a meal for things that may or may not be dogs? Lockdown is non stop action. Both Alex and the reader never pause for breath. One minute, it's arrival in Furnace; next is scrambling for the cell as sirens ring and dogs are let out; then there is the terrifying moments when "they" come, in the night, to take people away. Turn the page (or in my case, listen for one minute more) to find out what happens next, what Alex does next, whether Alex can figure a way out. Because while everyone says escape is impossible, Alex doesn't care what everyone says. Oh, Alex. He is an old-fashioned hero, but I doubt he'd think of himself that way. He admits, right up front, his bad choices and his thieving ways. When he has to, he fights. But he's not all bad; actually, getting convicted of murder and thrown into Furnace has scared him straight. Instead of entering Furnace as a bully, Alex stands up for what he thinks is right even if it is not easy. This is all first person, so not only do we get into his head; we hear his oddly lyrical thoughts. Damn, but Alex has a way with words! Not in a take up paragraphs describing something way, but in a turn of phrase: "hurricane of thoughts," "bruised shadows." He's tough -- he has to be, to survive in Furnace. And survive Alex does. But Alex is also open and up front about his emotions. He throws up from fear. He cries, from fear, from relief. And sometimes he laughs at just how absurd his life has become. Most of Lockdown is a tour of life in Furnace; of what this new world is. And because it's about violence, and death, and blood, it's a nasty, horrifying tour. Alex begins to think of escape, even though he is warned not to. How can one survive without hope? This is narrated by Alex Kalajzic. Who is brilliant. The series is from England, so Alex has an accent and the various boys he encounters have accents from various parts of the UK. I cannot wait to see what happens next. Knowing it is a part of a series meant that I knew, well, whatever ending Smith gave would not be a "final" ending. With that in mind, the ending of this first book is very satisfying. With a cliffhanger. And I want the sequel, which is out this year, NOW. And I won't tell you the title of the next one. But I'm almost giddy wanting to read it. I loved Lockdown. I expected all the action but the emotion was such an unexpected surprise.